Nearly three years after President Barack Obama enacted landmark health care reforms, the American public remains uninformed and divided about the law, according to survey findings released Wednesday. Overall, public opinion remains mixed and heavily influenced by political party affiliation, the Henry J. Kaiser Family Foundation poll, conducted earlier this month, reveals. Forty percent of those surveyed said they have an unfavorable view of the reform law, 37 percent hold a favorable view and 23 percent had no opinion. 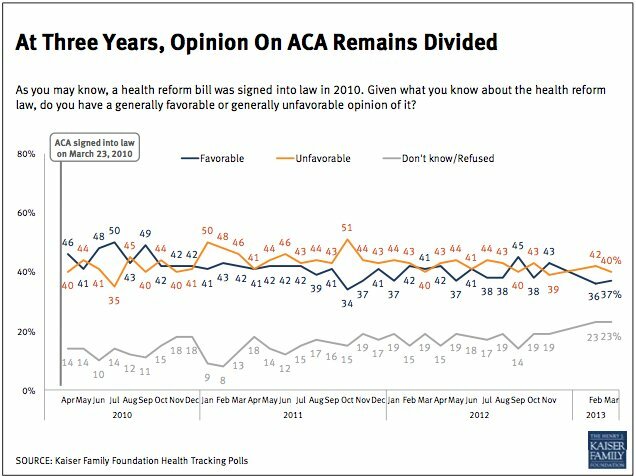 Among Republicans, 68 percent said they had an unfavorable opinion of Obamacare, while 45 percent of independents said they had an unfavorable opinion. Among Democrats, 58 percent said they liked the law. These findings are roughly consistent with the foundation's polling over the last three years, although the percentage with a favorable view has crept downward in recent months. The poll underscores the massive challenge facing the Obama administration, the states, the health insurance industry and others with an interest in health care reform succeeding. Small businesses and individuals who don't get health benefits at work will begin shopping for coverage and learning whether they qualify for financial assistance or Medicaid benefits on Oct. 1. Perhaps most worrisome for the administration is the Kaiser Family Foundation's findings that the American public is still uninformed and confused about what's in the law. Fifty-seven percent of those surveyed said they didn't have enough information about Obamacare to predict how it would change their own health care. 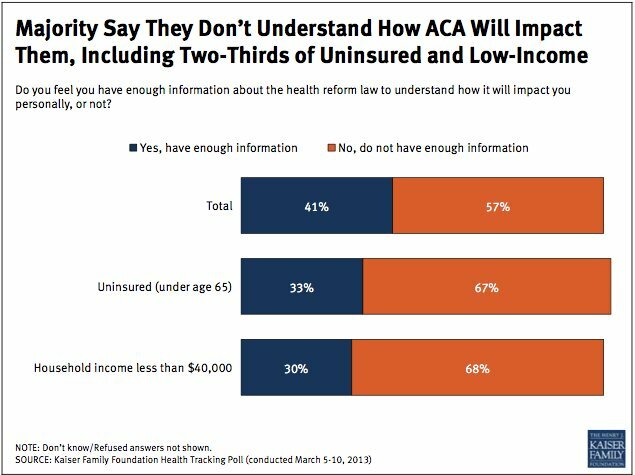 Worse, more than two-thirds of those without health insurance and those who earn less than $40,000 a year -- the very people the law is supposed to help -- said they didn't have enough information. In fact, public awareness about key provisions of the law, including the availability of health insurance tax credits for individuals and small employers, has actually declined since April 2010, the survey shows -- despite three years of continued public debate about Obamacare. As other polls have shown over the past three years, people reported favorable views of individual elements of the health care reform law even as many said they oppose Obamacare as a whole. More than 80 percent of people approve of things like health insurance tax credits for small businesses, improved prescription drug coverage under Medicare and the creation of health insurance exchanges that allow comparison shopping for benefits. Majorities also support expanding Medicaid, providing tax credits for individuals to buy health insurance, requiring insurers to offer coverage to people with pre-existing conditions and subjecting large employers to financial penalties if they don't cover their workers, the survey found. The least popular part of health care reform is the individual mandate that nearly every legal U.S. resident obtain some form of health coverage, which just 40 percent favorably view, the survey shows. The individual mandate also is the law's best-known component, as 74 percent of respondents said they were aware of it. What people didn't seem to know was that many of the policies they like are included in the Obamacare law. Just over half of those surveyed were aware that the law provides tax credits to small businesses that offer health benefits to their employees. 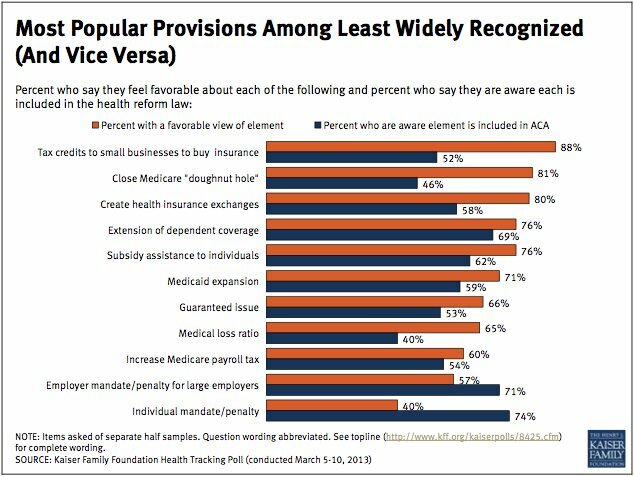 Fewer than half knew about the law's enhancements of Medicare's drug benefit, and just over half said they knew Obamacare forbids health insurance companies from denying coverage to people with pre-existing conditions. Meanwhile, a large pluralities of the public continue to falsely believe that the Obamacare includes so-called death panels that would ration health care for Medicare enrollees, reduce what Medicare covers, provide health benefits to undocumented immigrants and create a government-run "public option" health insurance program to compete with private companies.